For years I’ve kept my data backed up on an external hard drive. This has its advantages. The data is always there for me to access, and I can physically move the hard drive, in case of emergency or random paranoia. But what if my house burns down? Granted, my ioSafe external hard drive is fireproof and waterproof, but fires can sometimes rage for a long time and surpass the fire rating on those things (or perhaps I’m wrong — see note below, which makes me love ioSafe even more*). And a combination of onsite and offsite storage is always recommended. I got the opportunity recently to try out CrashPlan, one of the online cloud-based backup services. Though it is an online service, you still install an application on your own machine which handles the backups for you. It was very easy to install and sign up for an account. You then decide which parts of your computer you’d like to backup. The default settings backup the user directory, but you can choose to change that. Once you get the application installed, you can start backing up to CrashPlan’s online servers right away. Set the part of your computer that you want backed up, and then just click the button. The first time you back it up, it can take a very long time (days or weeks, depending on how much data you want to backup and how much of your CPU you are dedicating to it), but you can close the application and it will keep backing up in the background. After the initial backup, CrashPlan will automatically backup files that have changed or are new. It does this in the background, but I sometimes still notice a brief slowdown. If you have any trouble, you can change the settings so that it doesn’t tax your system when you’re actively using your computer. CrashPlan also has an interesting feature to backup to a friend’s computer, encrypting your data along the way; backup to another computer locally; or backup to a folder on your computer, for free. To back things up to CrashPlan Central, however, it takes a paid subscription. My unlimited year long trial only would cost me $49, however. This is a bargain when compared with losing important data. CrashPlan also has a lot of security built in. Check out their site for more details. I really like this “set it and forget it” kind of plan, but I don’t think it will entirely replace my fireproof/waterproof external hard drive, or my backing up my photos onto digital media. Still, a completely up-to-date backup copy of important files on my computer is very valuable to me. I’ve been fortunate never to have had a hard drive die, but it could always happen at any time. As a part of the CrashPlan service, you can access your files through the desktop application, so it also functions as cloud/off-site storage of your files. As a bonus, there is also a CrashPlan iOS app, where you can also access your backed up files. Envision a scenario where you require a document on your desktop machine at home. “Oh, man,” you say. “It’s at home!” But then you think, “But wait, I backed it up. I can access it from my iPad.” And then you bring up the document and save the day. Well, it could happen. I can’t compare CrashPlan to any other online backup service since it’s the only one I’ve tried, but if you can be patient for the initial backup to complete, I highly recommend it for peace of mind and security of files, and as a bonus, access to all of your backed up files from your iOS device! Pros: Automatic constant file backup, affordable price, access to files from your regular computer or iOS device. Cons: Works constantly and can slow down your system, takes a while for the intial backup. 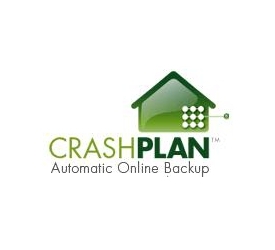 Prices vary from free to $6 per month for different levels of CrashPlan’s services. Check out their website for more details! Note: I received a one-year subscription to CrashPlan+ for the purposes of this review.